Get treated like a VIP in our Infield Experience! The tented infield experience is an event like no other. Feel the rush of excitement from the inside of the track, allowing you to be closer to all of the action! Enjoy the BBQ Chicken and sides from this unique view with your friends. A: Tickets are $55 tax and service fees included. Q: Can I come and go from the infield event? A: The VIP area is in the center of the excitement and has all amenities needed to make this an unforgettable evening, all guest are required to stay in the infield location. The VIP experience includes: parking, washrooms, ATM, bar service, BBQ dinner, betting/mutual tellers, large screens, prizes, photo booth and more. A: A perk of the infield event is VIP parking. You can enter the tunnel off of Dundas and Egerton to park in the infield very close to the event. A: This VIP experience offers everything you need! Q: What does the dinner include? Q: What time will the Camluck Classic go at? 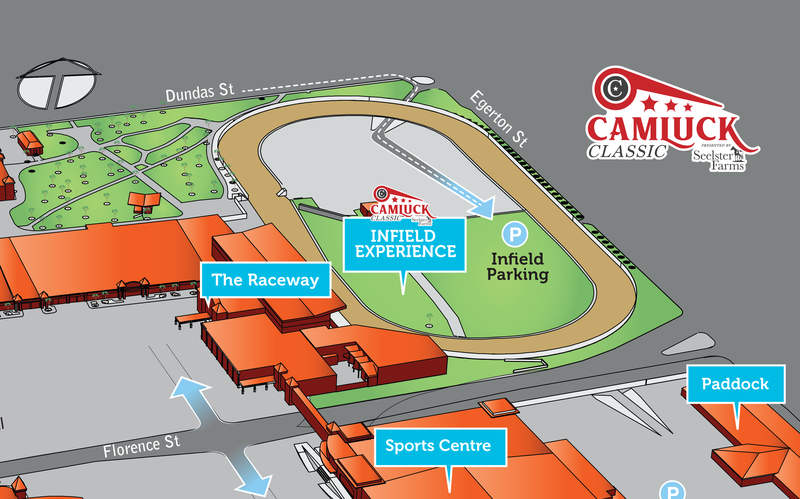 A: The Camluck Classic will be our last race of the night and will go at approximately 11:30 pm. Q: What are the exclusive draws? A: The draws will be for tickets to some of our Western Fair District owned and operated shows! A: The infield event is held in a 300 square foot tent. In the case of inclement weather you will be out of the elements. The Camluck Classic is a rain or shine event. Q: If I don’t want to buy a VIP ticket can I still come to the Camluck Classic? A: Yes, the grandstand side is free to attend and will have lots going on as well. The party on the patio is the spot to be if you are not in the infield.